Red Bird, originally uploaded by SkeletalMess. This is lovely. Great colours and textures. You really live in a beautiful land. And do really magnifical pictures. Cardinals - what show stoppers. Glorious photo of a beautiful bird. Beautiful Jerry! Which of your Textures did you use on your own photo here, it's wonderful! 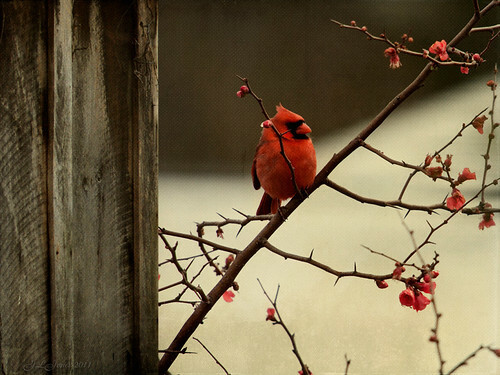 Beautiful cardinal photo! I love the red/brown colors. oh Jerry..... such a lovely image! Hi Jerry, got your blog detais from Nacherluver, really like the photographs, they are all just so full of timeless magic. Gorgeous the way the bird matches the berries. Great job. and look at the thorns on that bush. Very cool shot. For me it's all about the wood to the side of this image........that's what makes it something special......not just a picture of a cardinal in the snow. Overall toning is beautiful! wow Jerry this is absolutely gorgeous. I lpove the serenity of this that you have achieved with the depth of the red. Brings the beauty back to winter after a hectic week fighting the weather!